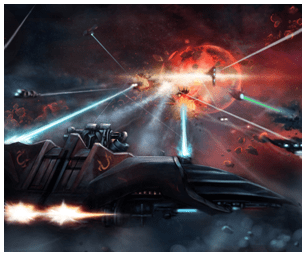 About a week before I launched this site, a browser-based 4X game called Star Supremacy was announced, which is a “a massively multiplayer war strategy webgame, adapted from the singleplayer game Light of Altair,” according to the publisher’s website. Well, today they released a press release detailing the games three factions as well as adding a couple new images, so take a look after the cut. I’ll look into getting some access to a preview shortly. Join one of the three factions to achieve your Star Supremacy! With the amount of web games that are flooding the market these days, it is not easy to find a game which offers players something original. “Star Supremacy” aims to make the old space exploration theme fresh for a new audiance. With three factions of deep characters in an expansive universe, “Star Supremacy” has a lot to offer to all players. The UEO is a cold, noble and cruely powerful organization. They are the faction with the most developed financial systems and the strongest military power due to their experience in control of the space around Sol. Players who choose to follow the UEO willl gain two main bonuses: A improved income from all trade and increased damage from their torpedo and laser weapon attacks. Moreover, the UEO has sole access to the battleship class giving them a powerful edge in combat if they can build up their fleet. Additionally, their organised structure will allow your colonies to work on more tasks at once, providing a great advantage during early development. The UEO is the choice of the most ambitious players who have the aim of exerting their power as quick as possible. The Altairian faction is quite different to the UEO. Their desire to remain one step ahead of their pursuers has pushed forward their technological drive. They are highly adept at gathering resources quickly on the move from asteroid belts and nebula and are keen to develop their high-tech abilities further. In combat the Altairians boast highly focused super lasers called lances as well as improved control systems allowing them to field many more fighter craft in battle. The Altairian faction is perfect for players who prefer a longer, yet stronger development stage that focuses on key goals. The Seekers are the last faction in the game. Their advantage lies in their efficiency and creativity due to their adaption to life in space. They are hard workers and can build structures faster than the others, and also have access to highly efficient industrial buildings that will boost their productivity rate of processing ore into more useful resources. Moreover, the Seekers have developed their knowelege of EM weapons like gauss cannons and rail guns as well as utilising reinforced armour plating. The Seeker faction is great for players who prefer a faster expansion speed and greater security. As well as the factions, another important feature is your choice of leader. Every leader plays a pivotal role in the game, and so it is necessary to carefully pick those who suit your play styles and needs to expand your empire. Each leader has five main properties, and as well as accompanying traits depending on their faction. Hector, the commander of the UEO, fully embodies the UEO’s characteristics of apathy, calmness and power. The advantage of Hector’s attributes lie in strategy, and include bonuses to his fleet’s weapon damage and defensive capabilities. When such an advantage is combined with the UEO’s already powerful spacecraft, he can allow players to be constant in their attacks attack and invulnerable in defence. Altair’s commander, Adrian has a distinguishing charm that matches the faction’s idealism. His charisma attribute can increase his colonies’ productivity and allows him to lead mighty fleets into battle. This makes his development of colonies quicker and greatly improves the development of his scientific and technological goals. It also gives your colonies a powerful supreme commander in battle. All these let Adrian become the Altair’s most respected and trusted leader. Alice, one of the leaders of the Seekers, is a beautiful woman who embodies their virtues. She has the strong and brave nature which all commanders should have, yet can also be calm when the situation requires it. This attribute makes Alice extremely skills in her financial undertakings meaning that she can gather the monetary supplies needed to maintain costly research and trade with other players. The game’s universe system is vast. Players will need to expand their empire over many colonies and train up the best leaders to keep control. You have full control over how your commanders train and develop through battle allowing players to pick and choose which attributes they would like in each colony. Leaders have other attributes beyond the tree detailed above, As well as strategy, charisma and financial management; efficiency and ingenuity are also keys to maintaining your empire. As for the advantages of these attributes, players will have to find out in-game! This powerful development system is just one of the ways that “Star Supremacy” will give players a enjoyable and unexpected surprise!